Willie Campbell hailed his Glenrothes team’s fighting spirit and believes their 2-2 draw against league leaders Musselburgh can be a springboard to success in the East Premier League run-in. The Glens were staring defeat in the face after finding themselves 2-0 down to Musselburgh – a team 15 points clear in the promotion race. However, Glenrothes produced an impressive comeback to salvage a 2-2 draw thanks to goals from Lee Celentano and Conor Schiavone last Saturday. Campbell praised his battlers and reckons they were unlucky not to go on and take the three points. And he feels the result will give them the platform to go and kick on for the rest of the season. He told the Gazette: “It was a great fight back. We have got a great team spirit and it is something that we work hard on. Strikers want to score goals but I asked mine to do a different job. People do not see the work rate and willingness to sacrifice himself for the team. He added: “If we had shown that self belief before we scored we might have won the game. It felt a little bit mixed emotions because we were severely depleted with five or six first team regulars out. Glenrothes are in 12th place just two points off bottom-placed Kirriemuir Thistle but with three games in hand. 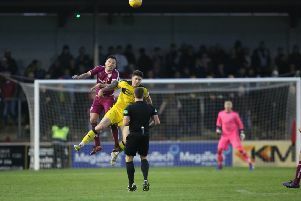 Campbell insists the first objective is to avoid relegation but he says the Glens should be looking at who is above them rather than focusing on who is behind. Campbell said: “The main aim is to stay in the league but I wouldn’t see that as a success for this club. We want to be looking at progress season by season and we are looking to win every game. “It might seem unrealistic but that is the target. I feel we are in a false position. We have lost games by the odd goal. It is about turning these games into draws and wins and we’ll take confidence from Saturday’s performance. Next up for the Glens is Fauldhouse United. United were beat 5-3 by Thornton Hibs last Saturday and Campbell admits he is expecting an reaction from Fauldhouse after that defeat. Campbell said: “It was a bad result for them – not being beat by Hibs – but the fact they were 4-0 down after 28 minutes. I’m expecting a backlash, they have spent a bit of money on the side and are probably second best in the league. We haven’t played them yet this season. It is a chance for us to build on last weekend. We’re hoping to have one or two more back from injury."